Nighthawk News - Read All About It! Hanover Youth Wrestling and All Things Wrestling!! - It's About Good, Tough Wrestling!! Wrestling Banquet News Our end of the year banquet was held on Wednesday, February 25, 2015 from 6:30p-8pm in the Hanover High School Cafeteria. It was great spending time with our families once last time this season. Congratulations to our wrestling award winners - Dalton Kirby (Terry Conover - 6th Grade Leadership Award), Nathaniel Handy (Outstanding Wrestler Award), and William Saner (Ralph Kuhn Most Improved Wrestler Award). We are proud of you guys and all of our wrestlers for another fantastic season! Special thanks to Danielle Brown, Trina and Doug Beckner, 'Peanut' and Bob Beckner, Coach Jon Beckner and Amber Beckner, Christy and Coach Andy Beckner, and Angie and Daniel Pierce for their help in setting up the banquet. A VERY Special Thanks to all of our coaches, parents, and wrestlers for making another great winter wrestling season! Enjoy your time off and look forward to seeing you next season. Do check the website for periodic updates on Summer Camp and Wrestling Activities throughout the year. 2015 Hanover Nighthawks Youth Wrestling Tournament - another Huge Success! 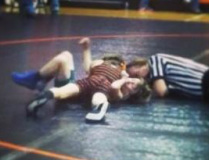 Our Hanover Nighthawks Youth Wrestling Tournament was held on Sunday, January 4, 2015. We had over 250 wrestlers participating from all around PA and northern Maryland. We had many compliments from parents and coaches about the efficiency in which it was run. This could not have been done without the help of our coaches, parents, and volunteers. We just wanted to thank all of the parents who donated concession items and helped with the set-up and running of our third annual tournament. It was a very successful tournament and it couldn't have been done without you! Also, special thanks to all of our coaches and parents running registration and the head table! You guys rock! Our Nighthawk youth tournament will be an annual event and next year we hope to top 300 wrestlers! Without you, this would not have been a success! ALL PARENTS and FAMILIES A HUGE special thank you for all parents who responded to the asking for help particularly those who did not even have a wrestler in the tournament that day. Thank you!!! PENN STATE MAKES HISTORY WINS FOURTH NATIONAL CHAMPIONSHIP IN A ROW!! Oklahoma City, OK (March 22, 2014)- Penn State Wrestlers win their fourth national championship in their 2014 campaign crowning two champions, Ed Ruth (Harrisburg) and the "Magic Man", David Taylor. Ruth becomes the first Penn State Wrestler in history to win 3 national titles and David Taylor joins an elite group of Penn State Wrestlers with 2 crowns. Nico Megaludis dropped a tough controversial decision in the semi-finals and fought back to finish 3rd becoming a three time All-American as a junior. Matt Brown and Freshman Zain Retherford captured 5th place and James English (York, PA) and Morgan McIntosh each captured 7th place all securing their All-American status. Penn State fought off formidable charges from host Oklahoma State and Minnesota to capture this rare feat of a fourth straight team crown. They join Iowa and Oklahoma State as the only three wrestling programs in the country to ever win 4 national titles in a row - an elite bunch for certain. Nighthawk History - Ian Brown wins 100th Wrestling Victory . . . we are Hawk Proud! Former Hanover Nighthawks Wrestler Ian Brown (now wrestling at Lehigh University) pictured with our Hanover Youth Wrestling Dual Meet Team. Way to go, Ian! Your wrestling family is proud of you for achieving this incredible wrestling milestone! The Hanover Youth Wrestling program sponsored Ian as a member of the PA Junior National Team. Watch Wrestling Stars - Want to watch your favorite High School, College or Olympic wrestlers in matches you've only heard about? Click HERE to go to the FloWrestling site, the nation's leading archive of all things wrestling. Simply type the wrestler's name in the search engine and the video(s) will appear! Check out scoring machine David Taylor of Penn State or cradle guru Ed Ruth, ranked #1 in the nation. Never seen Cael Sanderson wrestle? You can at FloWrestling. You may also want to check out the Cody Wiercioch and Chance Marsteller match from this year's PowerAde tournament in Pittsburgh . . . you won't be disappointed! Two PA high schoolers who are #1 and #2 in the COUNTRY!! Our wrestling family and friends continue to remember the Stan Dutterer family as Stan died as a result of a car accident. Stan was a wrestling referee (and an official for many other sports), father, grandfather, great grandfather, and friend. For decades, Stan was a staple and familiar face to all sports fans in the Hanover area especially in the wrestling community. We send our special well wishes for our teammate Aizik Shoap and his mom Danielle Brown who are the great grandson and granddaughter of Stan as well as his son and former Hanover wrestling coach Neil Dutterer and the rest of Stan's family and friends. Stan refereed dozens of our youth wrestling matches over his many years and was a referee and supporter of every single coach of our Hanover Youth team who wrestled in the Hanover area. Stan's contributions to the sport of wrestling especially in his beloved Hanover area are so many. We will always remember and miss you very much Stan! Click HERE for a tribute article written about Stan in the Evening Sun. 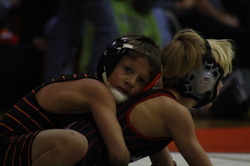 PA Youth Wrestling Website - Parents may find more information about Pennsylvania Youth Wrestling news and many tournaments by visiting the website http://www.pywrestling.com/ An excellent resource for all area wrestling families!! As many of you are aware, the Executive Committee of the International Olympic Committee (IOC) had previously recommended that wrestling be removed as a sport from future Olympic Games. After numerous advocacy campaigns and meetings with wrestling officials and representatives throughout the world, the IOC voted on September 8, 2013 to RESTORE wrestling to its proper place in the Olympic Games. Congratulations wrestling world and its supporters. We look forward to seeing our U.S. Freestyle and Greco-Roman Wrestlers in the 2016 Olympic Games! To show your support for our great sport, register in the National Registry 4 Wrestling! It's quick and free and a great way to demonstrate how beloved and supported our great sport is. Click HERE for registration information.